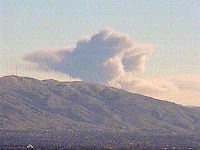 SAN JOSE, Calif. -- Cal Fire is conducting a controlled burn Wednesday on Mt. Hamilton that has attracted the attention of thousands of South Bay residents. Officials at Cal Fire stationed in Morgan Hill said the fire is being held to about 700 acres. The plume of smoke could be seen by drivers along Highway 101 from Sunnyvale south.The burn is located near the Lick Observatory.